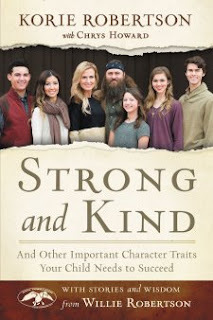 "Strong and Kind and Other Important Character Traits Your Child Needs to Succeed" by Korie Robertson with her mom, Chrys Howard, is a parenting book that contains encouragement and stories that will inspire you in your own parenting journey. This book is not your typical parenting book because it isn't so much telling you how to parent as much as it encourages you to pick specific character traits and be intentional about instilling them in your children. Character traits that are discussed include being: strong, kind, self-controlled, honest, compassionate, patient, joyful, loyal and humble. Bible verses are used in discussing these virtues and personal parenting stories are shared from both Willie's childhood family and Korie's childhood family. Noting the difference between these families remind us that there are many different ways to raise kids. Stories from Willie and Korie's own family are also shared. Some themes in this book include: being consistent so your kids know what's expected of them; not presenting a 'perfect' view of yourself to your kids; and letting your kids work through things on their own before interfering. One thing that I did not agree with is the idea of holding a child to "train" them. (pg 35 and pg 61). This was brought up as a way to teach a child to sit through a church service and was referred to as "the daddy straitjacket". I think that not all children can handle sitting still in church. When toys and snacks and colouring don't work, sometimes they just need a walk outside or a visit to the nursery to play for a while. Personally I see this as a stage and not a willful act of disobedience on the part of the child and I think given time, many children, (but not necessarily all), will be capable of sitting in church. This book made mention of Louie Zamperini which lead me to watch the movie "Unbroken" based on his experiences during World War II. This movie is amazing. Be sure to watch the bonus features too! If you are a fan of Duck Dynasty and if you are a parent (or intend to be) this book is worth a read. Ultimately this book reminds us: "Being perfect parents and raising perfect children should never be our goal. Raising children who believe in a perfect God is." (pg 105). How true this is -- and if we can instil in our children some of the characteristics of God along the way, all the better. sounds like a great book. adding to my to read list!